The versatile MS 231 chainsaw is ideal for private users or farmers felling small trees, cutting firewood and general landscape maintenance. 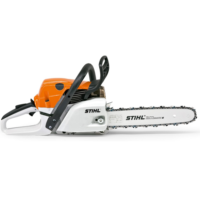 The STIHL 2-MIX engine allows emissions to be cut by up to 70% and fuel consumption is up to 20% lower compared to a STIHL 2-stroke engine of the same power output without 2-MIX technology. The current model features a 16″ Bar.